The Greenland ice sheet records information about Arctic temperature and climate going back to more than 120 000 years ago. 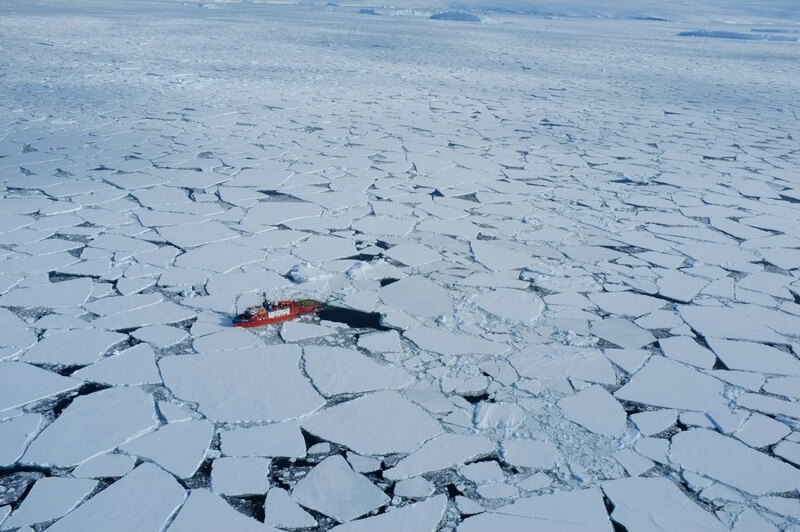 But new research from the Niels Bohr Institute among others reveals that the ice doesn’t just tell us about the situation in the air and on the land – it can also tell us about what was happening at sea. 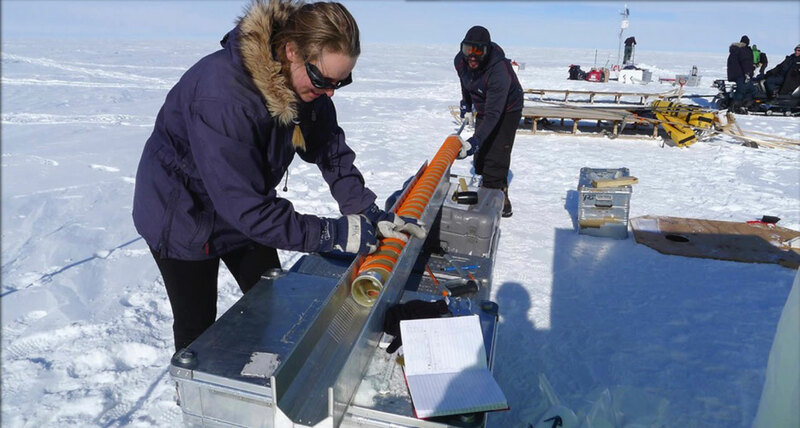 By analysing ice cores drilled from deep inside the Greenland ice sheet, researchers have started to calculate how much Arctic sea ice there was in the past. The results have just published in the research journal Scientific Reports. 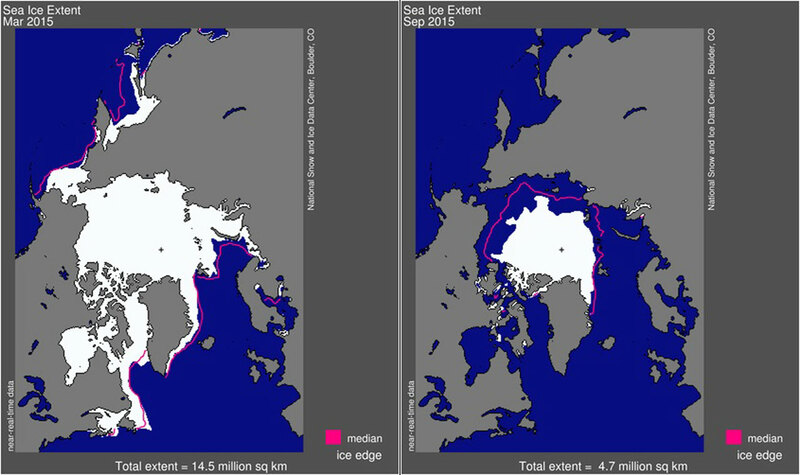 Arctic sea ice is changing, with less of the ”old and thick” sea ice, which survives through the summer, to ”new and thin” sea ice which melts in the spring and summer. Credit Andrea Spolaor, Ca’ Foscari university of Venice. Researchers at the Niels Bohr Institute in Denmark and Ca’Foscari University of Venice in Italy have discovered that chemical traces of sea ice can be found far away from the ocean within the kilometres-thick Greenland ice sheet. The ice sheet is covered by snow which falls every year and is compressed into ice over many thousands of years. Every layer of ice tells us about the year that the snow originally fell on the ice sheet – what the temperature was like and what kinds of particles were blowing around in the atmosphere at that time. 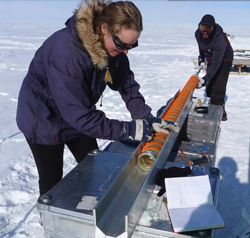 ”We can measure the amount of a chemical called bromine in the Greenland ice cores. You find bromine in both the ocean and sea ice, but when new sea ice forms in the winter the sea salt is concentrated into salty pockets of brine which contain bromine. In spring and summer, the sunlight that shines down onto the sea ice starts chemical reactions. In these reactions, ozone in the air reacts with bromine in the ice and the bromine is released in greater and greater amounts from the sea ice. This process is called a bromine explosion. When it is released from the sea ice, the concentrated bromine is carried by the wind up onto the ice sheet and then deposited with the falling snow. 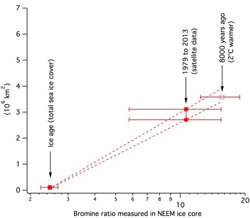 That is the source of the bromine we measure in ice cores”, explains Paul Vallelonga, Associate Professor at the Centre for Ice and Climate at the Niels Bohr Insitute, University of Copenhagen. The reactions stop in autumn and winter, when the sun goes below the horizon and new sea ice begins to form again. ”With this technique we can fill the gaps in our understanding of the amount of Arctic sea ice in the past. Since ice cores also reveal a lot of information about the climate, we can combine the sea ice data with the climate data and start to understand how sea ice reacts to climate change” explains Paul Vallelonga. 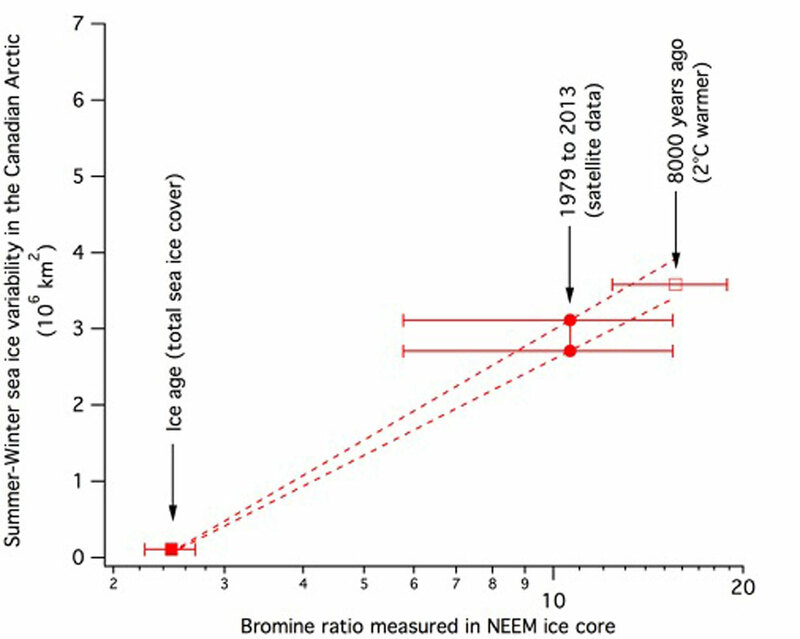 A chart showing the relation between bromine salt in the NEEM ice core (bottom axis) and the amount of new sea ice in the Arctic created each year (left axis). 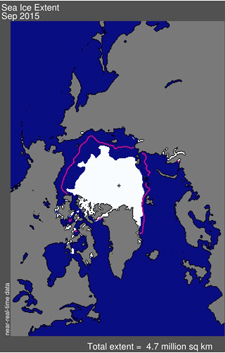 The current amount of sea ice has not yet exceeded maximum climate value of about 8000 years ago. Credit Paul Vallelonga, NBI. ”We have been in this situation before, with less sea ice and more open ocean during the warm Arctic summer. So right now we have not yet exceeded the natural boundaries for the Arctic region, but the question is: with more warming in the Arctic driven by rising greenhouse gases, how soon will sea ice melting reach and exceed the levels of 8000 years ago? These new research results can help us to answer this question when we combine them with climate models”, says Paul Vallelonga.